There is so much aviation activity in the area, that there is an obvious danger of overlooking this fine aviation museum. Looking around before entering, one hears the roar of heavy jet engines taking off at Anchorage IAP, the seaplanes landing at Lake Hood fly overhead, while a bit further down bushplanes on wheels touch down or take off. At the rim of Anchorage city sits Elmendorf AFB, where the military have a considerable air force based; in the center of town is Merrill Field, in itself a location saturated with history. But the museum has a firm grip on Alaska's fascinating aviation past, planes on display and tales ready for reading of those aviation pioneers which made aviation take off as an industry, an identity even, against the odds of the harsh, unforgiven climate here on the Last Frontier. Take a few hours to visit the museum and do like I did: go again upon a next visit! You won't regret it. Meanwhile enjoy my photoreport of this June 2012 visit. Stearman C2B NC5415, manufactured in 1928, was owned by several firms and flown by a number of individuals., some of them famous pioneers! These included Arctic Prospecting & Developing Company of Fairbanks (certificate signed by Walter Varney) in June of 1928, to Noel Wien of Alaska Airways in October of 1928, to Alaska Airways of Fairbanks, Merle 'Mudhole' Smith (the owner of Cordova Airlines), and a Mr. Les Kares. In 1932 this plane was one of the first to land on Mt. McKinley. The plane crashed in the Wrangell Mountains and was later restored by Mr. Kares, over a 10 year period while living in Montana. NC5415 was also flown by Joe Crosson, who is regarded as perhaps the greatest pilot in Alaskan aviation history. It was sold to The Alaska Aviation Museum in December of 1991. Northwest Airlines (from St. Paul, Minnesota). Wien Alaska Airlines purchased the Metalplane in 1937 and brought it to Alaska. Wisconsin-born Robert (Bob) C. Reeve (March 27, 1902–August 25, 1980) first barnstormed in the 1920s before joining Panagra, the Pan American-affiliated air-mail carrier in South America. By the mid 1930s, Reeve had established himself as a highly dependable pilot. He hauled mining machinery high into the mountains, landing on glaciers. He handled medical emergencies and delivered fresh fruit to isolated residents. With his fleet of one Fairchild 51, he called himself Reeve Airways. He later added a Fairchild 71 and constantly tinkered with his planes and engines to optimize their performance. From Valdez, Reeve moved to Fairbanks in time to participate in the military buildup preceding the U.S. involvement in World War II. He regularly flew the Boeing 80A. In July 1946, DC-3 N91016 was purchased from the USAF. In the winter of 1946–47, Reeve filed with the CAA for a license to operate on the 1,783 miles (2,869 km) run between Anchorage and Attu, and in the summer of 1947 he was making weekly flights down the chain. Within a year, he was running a twice-weekly service, keeping all four DC-3s busy. A strike by sailors on steamships operating between Seattle and Anchorage started on April 6, 1946. Reeve, along with Merritt Boyle and Bill Borland began flying between Seattle and Anchorage, with stops at Juneau, Yakutat or Annette Island. Each trip carried a full load of 21 passengers and took an average of 9½ hours. On March 24, 1947, Reeve Aleutian Airways was incorporated. In April 1948, Reeve Aleutian Airways was granted a temporary, five-year airline certificate. Various types of aircraft were used and traded for yet other or more aircraft. Issues on operating permits continued, even after 1948, when Reeve Aleutian Airways was granted a temporary, 5-year airline certificate, with the need to run the business on proper business lines (maintain an office, publish schedules and tariffs etc.). By the mid 1950s, it was apparent that the DC-3s were not big enough for Reeve Aleutian. Therefore, the DC-4 was selected to supplement the DC-3s, eventually replacing them. In 1957, the Distant Early Warning line was being constructed, bringing a boom to Reeve Aleutian. Merrill Field proved too small for the DC-4, so Reeve Aleutian moved to Anchorage International in 1958. By the early 1960s, the DC-4 was proving outdated, and therefore a DC-6B was purchased in January 1962. The late 1960s saw the emergence of the Lockheed L-188 Electra, which was to be backbone of Reeve Aleutian's business from then on. In 1979, Reeve Aleutian started a service from Cold Bay to Seattle-Tacoma.This service lasted for three and a half years. During that time, only seven flights were cancelled due to weather and two due to mechanical reasons out of 458 scheduled flights. YS-11 N169RV was purchased from the Gabon Government in February 1980. In December 1983, Reeve Aleutian purchased two Boeing 727-22QC aircraft from Wien Air Alaska. Reeve Aleutian ceased operations on December 5, 2000, and about 250 people were declared redundant. Reasons given for the situation included increased competition and high fuel prices. The name Waco comes from the initials of the original company name, Weaver Aircraft Company, founded in the early 1920s. This aircraft came to Alaska in Dillingham on 26Nov1939. 'Red' Flensburg established Dillingham Air Service. It was also owned by Bud Branham, who operated Rainy Pass Lodge in the Alaska Range. Gift of Mr. and Mrs. Elmer Rasmuson. The Alaska Aviation Museum purchased this aircraft on 02Jan95. (1946) Taylorcraft BC12-D NC43606 (c/n 7265) Jack Carr Service. Wiley Post and American humorist Will Rogers were killed when Post's aircraft crashed on takeoff from a lagoon near Point Barrow in the Territory of Alaska. critical items were skis for landing on snow, ice and sometimes mud..
Don Sheldon, the famous glacier pilot. Donald 'Don' Edward Sheldon (21Nov1921 – 26Jan1975) was a famous Alaskan bush pilot who pioneered the technique of glacier landings in and around Mt. McKinley (Denali) throughout the 1950s and 1960s. Don was born in Mt. Morrison,CO and grew up in Wyoming; at age 17 he journeyed to Alaska to seek work and adventure. Although he was already a pilot, Don served in WW2 as a gunner in a B-17 Flying Fortress crew over Europe. There he flew 26 missions and was awarded the DFC and 4 other Air Medals. From his base in Talkeetna he operated Talkeetna Air Service, which ferried climbers, hunters, fishermen, and others to places inaccessible to ground transportation. Over the years, he assisted in numerous rescue operations, both civilian and military, and was awarded an Alaska Certificate of Achievement for his help. His planes, which included Piper Super Cubs, Cessna 180s and Aeronca Sedans were equipped with an assortment of landing gear, including skis, floats and large, soft rubber wheels. This plane was manufactured in 1929. It has a Wright 300HP engine and cruised at 110 mph for about 550 miles with 6 passengers in some comfort. The AAM Travel Air came to Alaska in 1939 with 'Mudhole' Smith's Cordova Air Service and later belonged to Peck and Rice Airways in Bethel. A number of pioneer aviators owned NC8159 including Albert Ball, Fred Goff and Al Jones. Restoration, including the original 1929 EDO floats, was done by a team of volunteer mechanics. Interesting account on Jack Peck, and other pioneering Alaska aviation, can be read on my page about Cordova Airlines..
two seat ultralight aircraft designed for kit construction in the 1980s. Stinson L-1 Vigilant liaison aircraft, originally designated 0-49, was the miltary version of the civilian Stinson Model 74. Between 1939 and 1941, the Army Air Corps ordered 142 L-1s and 182 L-1As with a 13-inch longer fuselage. Equipped with full-span automatic slats on the leading edge of the wings and pilot-operated slotted flaps on the trailing edge. Vigilants were well suited for operations from short fields. Due to its versatility, the Vigilant was used for a variety of missions both in the U.S. and overseas during WW II, including towing training gliders, artillery spotting, liaison duty, emergency rescue, transporting supplies, special espionage missions behind Japanese lines and even for dropping light bombs. Some Vigilants were converted as ambulance aircraft, sometimes fitted with skis or with floats for water take-offs and landings. Flown to Alaska in 1946 by former Governor Jay Hammond, the Loening is one of two existing today. The Keystone/Loening, model K-84 Commuter, was the last of a line of amphibious aircraft designed by Grover Loening. Loening was the first to design a practical amphibious aircraft. Leroy Grumman was employed by Loening when this aircraft was designed. When Keystone Corp. acquired the Loening Co, Leroy Grumman resigned and formed Grumman Engineering Corp. The original application for airplane license shows the date of manufacture as 19 February 1930. The aircraft was originally equipped with a Wright R-975A engine, rated at 300 horsepower. Throughout its life, this plane had engine changes normally increasing the horsepower. On June 27, 1946 it was sold to Jay Sterner Hammond of Rupert VT. Jay Hammond moved to Alaska shortly after purchasing this aircraft. Address:	4721 AIRCRAFT DR, ANCHORAGE, AK, 995021080, US. A check with FAA's N-inquiry website (10Oct2013) for N124AK had the same info for manufacturer, so obvious a homebuilt, but owner reg's as Alaska Aviation Heritage Museum with its certificate issued 06Mar2013. "The Circa Reproductions Nieuports are a family of Canadian 7/8 scale World War I sesquiplane aircraft replicas designed by Graham Lee of Lamont, Alberta for amateur construction from plans sold by Lee's company Circa Reproductions. Leading Edge Air Foils of Peyton, Colorado at one time also made construction kits available. Lee's Nieuports were amongst the earliest First World War replicas available and paved the way for later companies to produce plans and kits for a great variety of warbirds." An early flight simulator; we have better facilities at home these days! Plenty of mysteries here, but could it be the 1929 Bellanca Pacemaker CH300 NC168N? This aircraft first flew in Alaska in 1934 with Star Airways. It crashed in Rainy Pass in 1946 and was retrieved by Warren Magnuson several years ago. Acquired by the museum through a trade, the Bellanca is one of 6 known to exist. Maybe one of these are candidates of the above photo too: like the (1942) Stinson L5 Sentinel. It was dDonated by Chuck Hughes in 1993, the Stinson L5 was produced for the U.S. Army Air Corps as a liaison and communications aircraft. Or perhaps the (1943) Cessna T-50 'Bushmaster' NC30023..? It was flown by Bob Reeve in the 1940's and used by him on famous glacier flights; one of six known to exist. Photo on Lars Opland's page on my website shows it in better days! 1937 Stinston SR-9 Reliant NC18419. Hanging there is a 1935 Bellanca Sr. Pacemaker; one of two examples surviving, the Senior Pacemaker is an improved version of the CH300 Bellanca Pacemaker. Although only the bare airframe survives today, this aircraft once flew with Pollack Air Service and Alaska Airlines. a military C45F to a civilian model 18S. A June 2017 photo showed it on display outside, on floats. Rumors of selling? Lars Opland sent me a photo, in a complete state, when it still resided at Wasilla's Transportation Museum, HERE..
(1944) Noorduyn Norseman NC725E awaiting restoration. At least this new tented hangar shelters it from the weather! Manufactured by Canadian Car and Foundry Co. to transport troops during WWII, the Norseman later joined the US Fish and Wildlife Service before coming to Alaska with Northern Consolidated Airlines in 1951. Interior Airways purchased the aircraft in 1955 to use during the construction of the DEW (Distant Early Warning, a defense system) line and for other bush flying. Donated by the Fairbanks North Star Borough and Jim and Dottie Magoffin. A brilliant restoration is in progress here, a truly unique and famous pioneering aircraft of Alaska! Fairchild Pilgrim 100-A N709Y, the last remaining Pilgrim in the world! See below for more information. I'll be sure to check up on it on a future visit! You'll find a photo on my page Photos by Friends & Guests (37) where it seems (almost?) completed! Front fuselage of a Sikorsky S-43, NC15062 (serial 4302), was owned at one time by Reeve Aleutian Airways. The Grumman Goose was originally designed as a commuter plane for wealthy businessmen and sportsman located in and around New York City The aircraft first few in 1937 and was in production until 1945. This aircraft, Grumman JRF-5, Navy BuNo.84807 was accepted by the Navy at the Grumman factory in Bethpage,NY on 29Nov1944. N789 was in service with the US Navy until being surplused to the US Fish & Wildlife Service in 1956. The immortal Grumman has flown all over Alaska from the Aleutian Islands to the Arctic Ocean throughout its service life. The Goose, N789, was donated to the Alaska Aviation Heritage Museum by the US Department of Interior in 1997. The Widgeon is the smallest member of the Grumman family of amphibious aircraft and was originally intended for the civil market. The first prototype flew in 1940 and over 200 Widgeons were built between 1941 to 1948. A Widgeon flying out of Houma, Louisiana was credited, in August 1942, with sinking the first German submarine sunk by the U.S. Coast Guard! The museum's Widgeon was built in 1943. Its military record and history prior to 1967 is unknown, except that it was on the Canadian registry for a period of time. In 1967 it returned to the States and was modified by McKinnon Enterprises to become a "Super Widgeon". Improvements included two Lycoming GO-480 engines, Hartzell 3 bladed propellers, metalized wings and flaps, and an increase in gross weight to 5500 lbs. N13122 was donated to the Museum by Mr. and Mrs. James Magoffin who were owners and founders of Interior Airways, Alaska International Air, and MarkAir. It was the Magoffins personal aircraft and they enjoyed flying it throughout Alaska, Canada, and the Lower 48. The Canso on display here was built in Canada by the Canadian Vickers company. It had hydraulically actuated tricycle landing gear for amphibious operations. This model had a bow turret with twin 30 caliber machine guns and self sealing fuel tanks. During WW2 it was used in anti-submarine patrol, observation, search and rescue. While operating with the 10th Rescue Squadron in 1947 at Elmendorf Air Force Base, the AAM Catalina made an emergency landing, due to engine failure, at Dago Lake on the Alaska Peninsula. The lake was too shallow for the plane to receive repairs and then take off. Declared government surplus, it was purchased by the R.S. Richards family, stripped of parts and left at Dago Lake until 1984. A gigantic recovery project conducted by the National Guard and the AAM volunteers finally brought the huge amphibian to the museum utilizing 2 Alaska helicopter operations in 1984 and 1987. This operation was captured in a film, called 'The Queen of Dago Lake'. The Stinson Aircraft Company was founded in 1920 by Edward Stinson. In 1925 the company moved to Detroit from Dayton and proceeded to produce more than 13,000 aircraft during the next 30 years. One of the most successful models built was the Reliant, more commonly known as the "Gullwing". 1,327 Reliants were manufactured from 1933 into the 1940's. Tribute to Northern Air Cargo's Bobby and Rita Sholton. Esspecially that line up of all the DC-6s will be remembered as a glorious time by Big Prop fans! 'Jetliner' equipment now take care of business with NAC. (1953) Douglas DC-6 N43872, ex/ Northern Air Cargo. place in the Alaska Aviation Museum. John Benton added (july 2012): "N43872 is former USAF 53-3294". In late-2017 it was found to have moved, not too far, as a gate display with the Coast International Inn nearby. 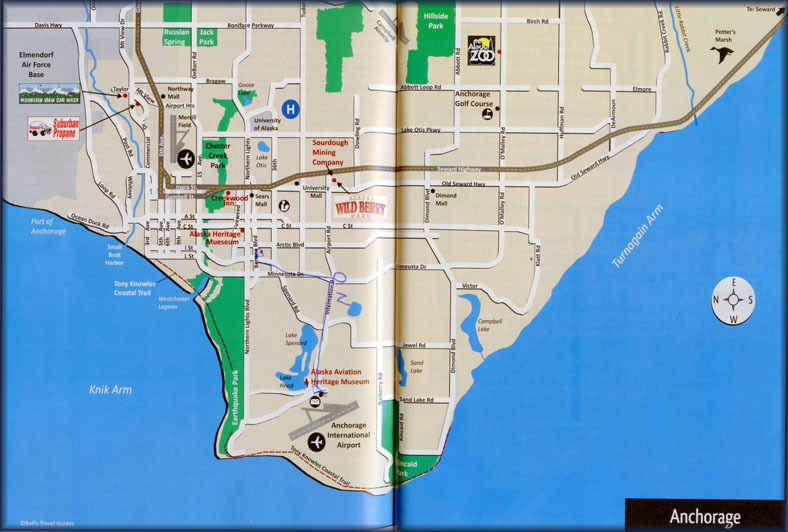 Anchorage map, showing the close proximity of the airport and seaplane operations, as well as the museum.